Aquilia Dance Academy offers latin ballroom dancing in Singapore to both adults and children. As a challenging dance genre that instills discipline and precision in its learners, latin ballroom dancing is an excellent activity that challenges both the body and the mind. 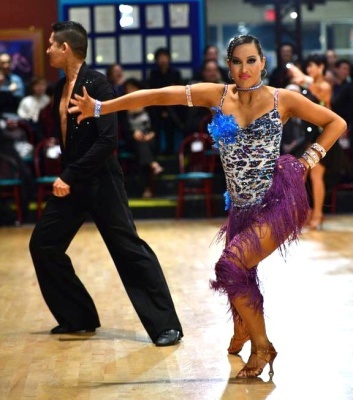 Samba in international ballroom dancing is a dance of carnival and joy. It takes on elements from Brazilian Samba and is danced to upbeat and rhythmical music typically with strong beats. The steps are characterised by bouncing or dropping actions with specific hip actions. A sensual and romantic partner dance, Rumba is the slowest of the five dances in Dancesport Latin. Many of the dance figures are similar to the Cha cha cha, but stretched out to a slower tempo. As rumba is an emotional and expressive dance, it is often danced by lovers on their weddings or on other special occasions. Cha cha cha is a flirtatious dance originating from Cuba and has evolved to become a widely known dance enjoyed both by the young and old. While usually danced to Cuban music, cha cha cha is now frequently danced to Latin Pop or Latin Rock. The original dance is danced on the second beat of the song and consists of sharp arm and leg actions. Paso Doble is a fast-paced Spanish dance historically used to represent a matador and his cape during a bullfight. It is frequently danced to the 'Spanish Gypsy' music or its derivations. The lead in this dance (as the matador) is portrayed as strong and macho, while his follow (as the cape) proud and graceful. The Jive is the only American dance in the Latin American genre of Dancesport and is a lively interpretation of the jitterbugs swing. Similar to the rock and roll, it is danced to fast-paced swing or 50s rock music. Basic steps include hip swing actions, kicks and the lifting of knees.